The importance of enriching, supportive early childhood experiences is clear, yet far too many families— especially families of color, families in poverty and those who are immigrants or refugees—do not have access to high-quality, affordable early education. The good news is that this is beginning to change through expanded investments and renewed focus at the local, state and national level. Even so, kids and families across the community often face a jarring transition as they work to learn the routines and expectations of elementary school. As preschool access expands to more families, the time has never been better to figure out how early learning programs and elementary schools can align their practices and improve transitions. 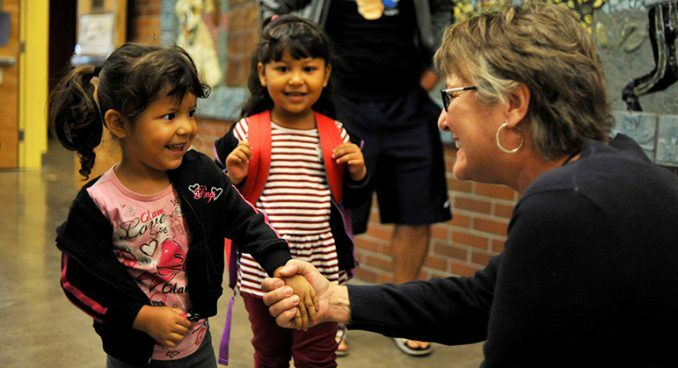 The potential of improving that transition strengthened in 2018 as Kindergarten Transition school community teams incorporated representatives from Kaiser Permanente clinics in order to add a healthcare component to the teams’ strategies. In early years of development, factors connected to health–physical, cognitive, emotional and social, language and sensory and motor development–are critical building blocks for children to be able to successfully engage in a school environment. By aligning with the healthcare sector, the chances of success in the transition to kindergarten improves. All Hands Raised is committed to incorporating other sectors relevant to the work in order to build our capacity around improving practices and accelerating results. Change starts with relationships—the site-based work is in an early stage and meaningful relationships between the early learning and K–12 educators have taken root. Click here to hear from Ronnie Herndon about progress being made. Cross-pollination is underway between the demonstration sites. Key practices they identify together will inform systemic change across the county. Currently, All Hands Raised is working on the ground with three school community sites. Click here or on the image to learn more about these teams. This work is guided by a Leadership Group, the composite of which is found here.